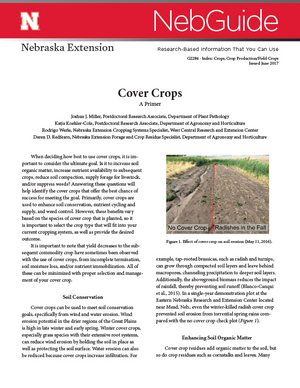 When deciding how best to use cover crops, it is important to consider the ultimate goal. Is it to increase soil organic matter, increase nutrient availability to subsequent crops, reduce soil compaction, supply forage for livestock, and/or suppress weeds? Answering these questions will help identify the cover crops that offer the best chance of success for meeting the goal. Primarily, cover crops are used to enhance soil conservation, nutrient cycling and supply, and weed control. However, these benefits vary based on the species of cover crop that is planted, so it is important to select the crop type that will fit into your current cropping system, as well as provide the desired outcome.